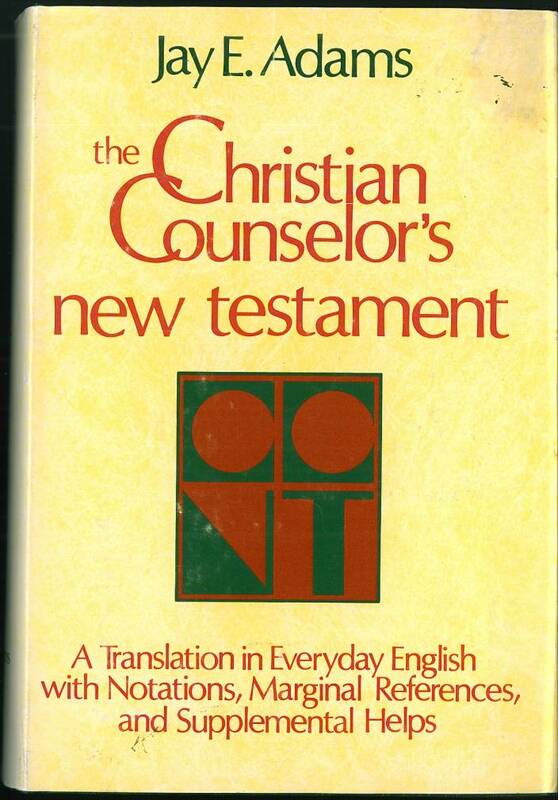 Title: The Christian Counselor's New Testament. 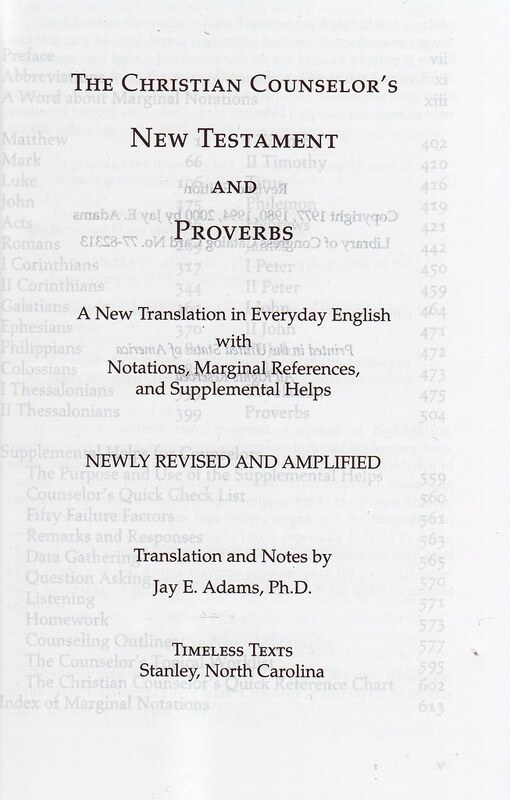 A New Translation in Everyday English with Notations, Marginal References, and Supplemental Helps by Jay E. Adams, Ph.D.
References: Chamberlin p. 591-10, Taliaferro-EELBV 8150.100. 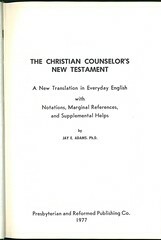 Comments: From the Preface: This translation was designed "as a working tool that may be used during counseling sessions … " Passages related to the needs of Christian counselors are highlighted in yellow and further explained in the notes. 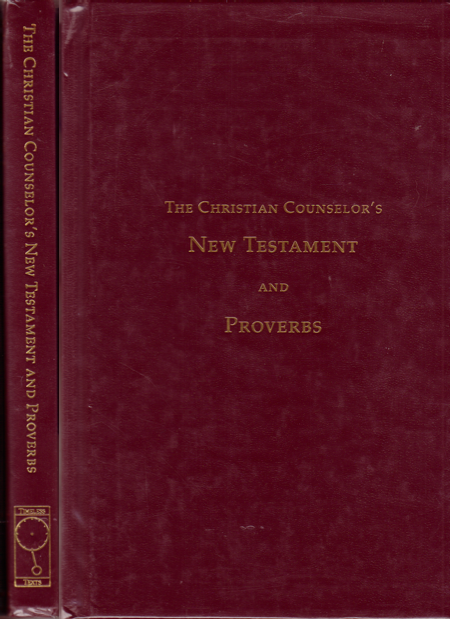 "In making this translation … I trust that you will discover many of the differences of style and spirit of the New Testament books." 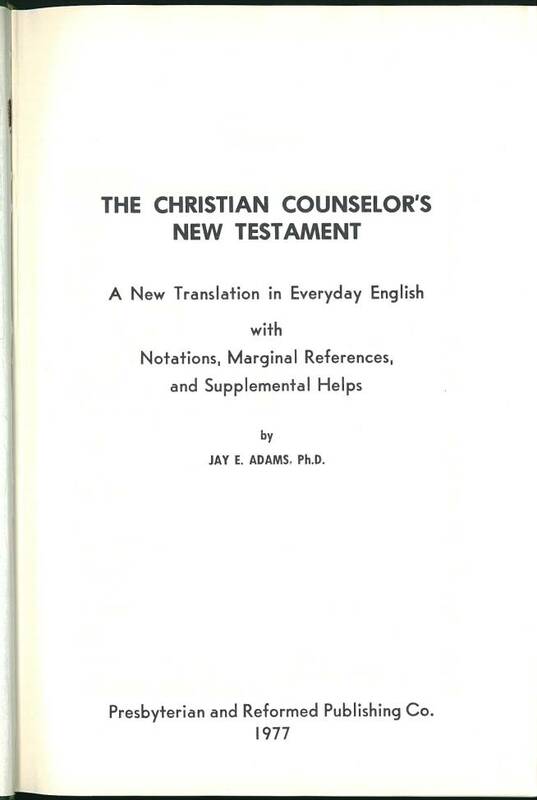 Title: The Christian Counselor´s New Testament and Proverbs ⁕ A New Translation in Everyday English / with / Notations, Marginal References, and Supplemental Helps / Newly Revised and Amplified ⁕ Translations and Notes by / Jay E. Adams Ph.D. Location: Collection Bibelarchiv– Birnbaum. Karlsruhe/ Baden, Germany. 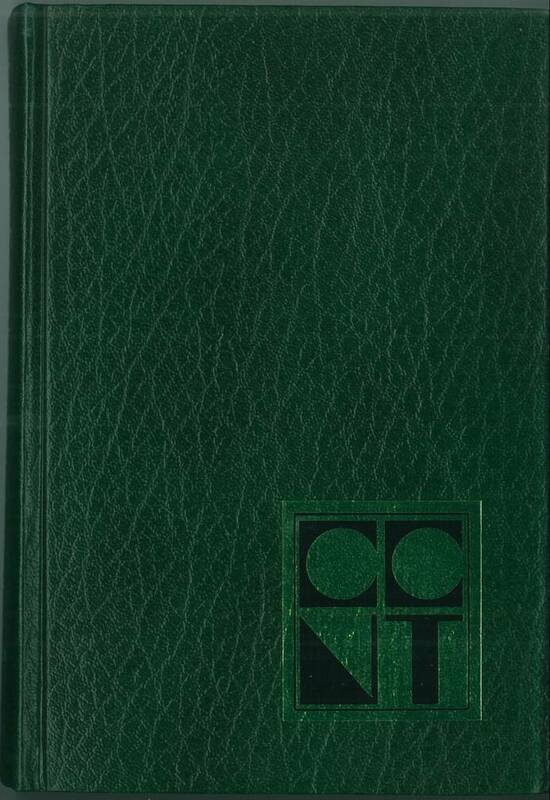 Comments: Hardbound octavo, XIV & 626 pp. ; adhesive binding. Scripture text in single column. Marginal– and footnotes. As in the 1977 ed. 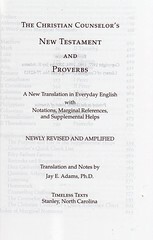 many scriptures or even parts of them are highlighted in yellow; this also in the Book of Proverbs. 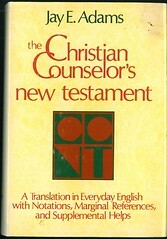 The NT translation has been altered in several places compared to the 1979 ed. 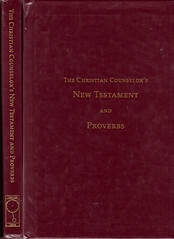 (the 1980 and 1994 editions aren‘t available here for comparison). Underlying text is a critical one, definitely not the Textus receptus or the Majority text; this can be seen in the omission of the story of “The Woman Taken in Adultery“; the footnote in John´s Gospel reads: »The best MSS do not include 7:53 – 8:11«, or in John ch. 5, where V. 4 is also relegated to the footnote, but at least translated. So it can be assumed that the blueprint Adams used is the UBS or, Nestle/ Aland, NT Graece.